Oil on board, 9 3/4" x 12 3/4"
$600, plus $10 shipping in U.S.
A larger painting today. I tried to catch the feeling of a windy early fall day. Even the buildings seemed to hunker down in anticipation of the coming storm. You really caught the mood, Don. The clouds feel like their passing by. Great job! "Hunkered down" barns look like so many barns that dot the countryside here in Ohio. 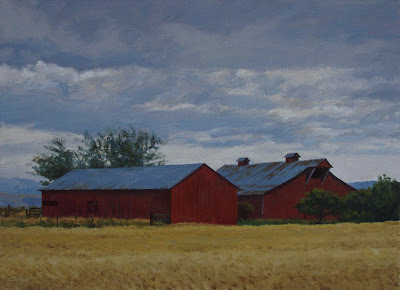 You captured a wild rural feeling, the perfect dark calm before a storm-- LOVELY! Diane, thanks for the encouraging words! Really nice of you to say, Diane--thank you! Hi Barb--Glad the sense of wind came across in the rendering of the trees. Thanks a lot! It really does have that Fall storm coming kind of look Don. Or at least a front moving in. Good job on the wind in the trees. You not only caught the light, but the wind direction too. I can even feel it in the grass. Great job on that portrait below too. Thanks, Frank--I appreciate your thoughts. This piece really has a feel of natural light - beautiful. I feel that fall day looking at your painting. Great Job! Thanks for the visit, Kim!